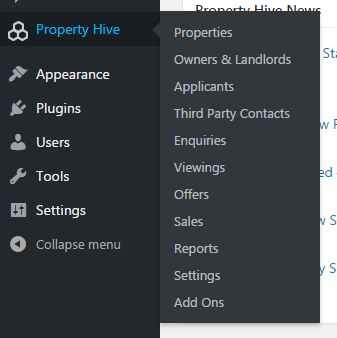 Upon installing Property Hive to your estate agency WordPress website, all related property information will be in it’s own area meaning everything is managed from the same place. Properties are treated just like normal WordPress posts and pages, meaning it should all be familiar. 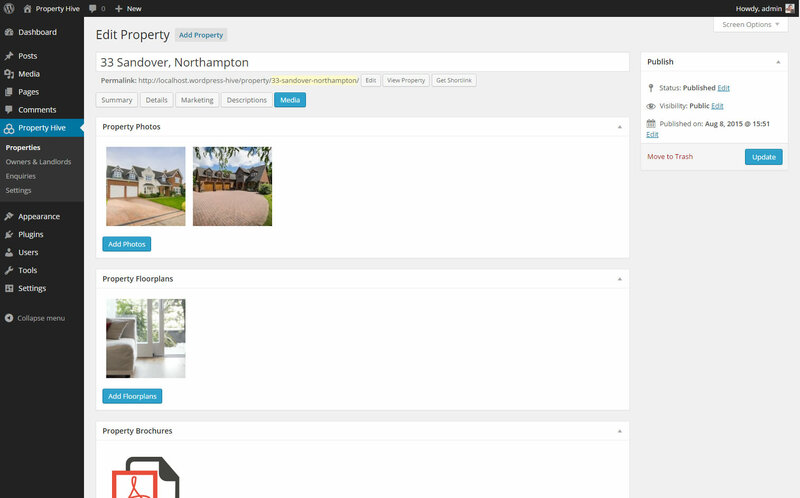 From the ‘Properties’ screen you can view and filter all of your properties. 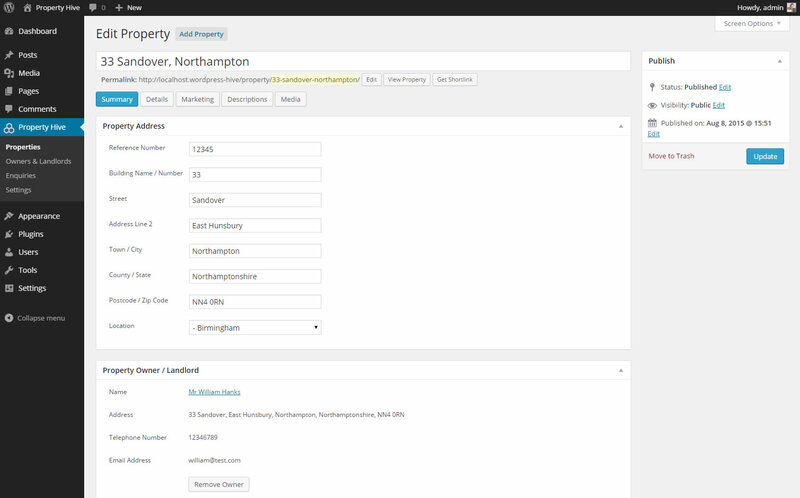 When editing a property in Property Hive, we’ve made navigating the record easy. Instead of a long list of fields, we’ve grouped related fields into their own tabs making it easy to jump to the section you want to edit. 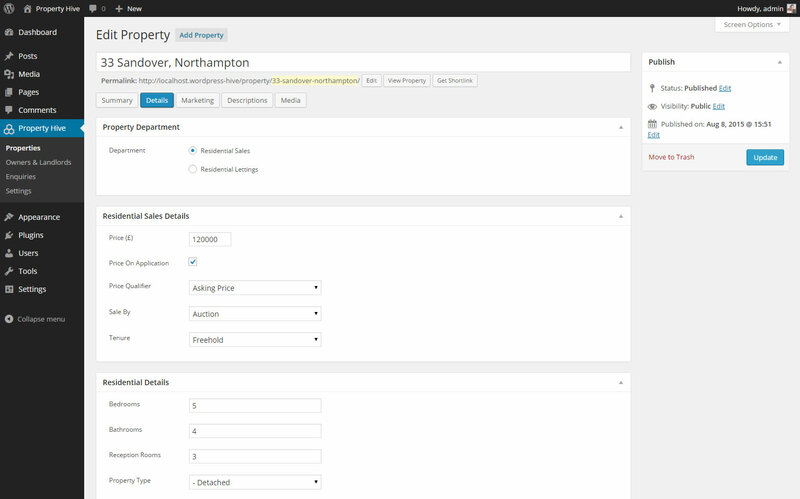 Under the ‘Property Summary’ tab, you can record the full property address, as well it’s exact co-ordinates (which can be overwritten) for when displaying the property on a map. More in-depth information about each property can be stored here. This includes fields such as bedrooms and bathrooms. Also record specific information based on whether the property is for sale or to rent, such as price, rent, furnished, and more. Set how the world will see your property. Is it on the market and available on the website? What’s the availability? All of this can be set here. 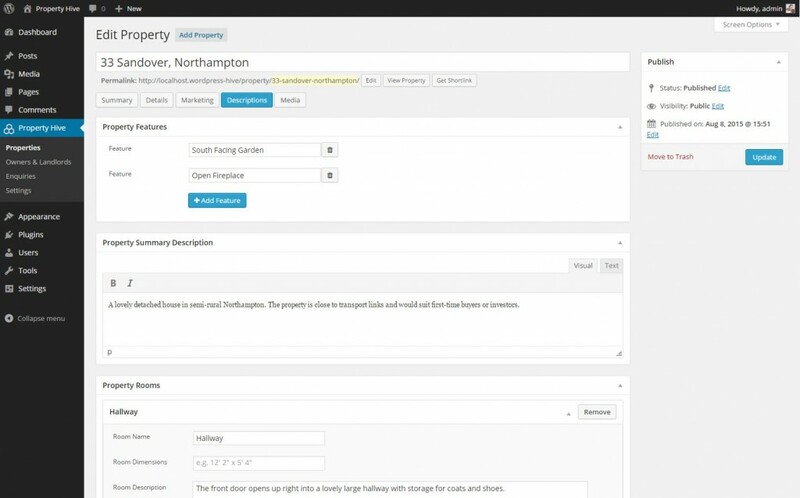 If you use one of our property portal add-ons you’ll also be able to set which property portals the property is sent to. In the ‘Property Descriptions’ section you can store an unlimited number of features, a short description about the property, as well as details about each room to build up the full description. It’s easy to allow potential buyers and renters to search and view properties on your website. Property Hive can integrate with any new or existing theme, and we even have our own themes available to get you up and running in minutes.